Despite personnel losses on defense, the Gators should challenge for the SEC East title. Will Muschamp’s second team in Gainesville won games through physical play and a grinding style, but its passing game did not put up a vintage Florida performance. The Gators’ 146.3 passing yards per game were their second-lowest for a season since 1979. Unquestioned as the primary quarterback, Jeff Driskel will need to improve his field vision and ability to read defenses. The junior is mobile, but he needs to do his part to decrease Florida’s sack totals. Driskel could be an improved quarterback, but he may not have the receivers and tight ends to showcase his ability. The Gators are looking at cornerback Loucheiz Purifoy and incoming freshmen, led by Demarcus Robinson, to boost the receiving corps. At running back, Matt Jones established himself as the top option, distancing himself from junior Mack Brown and freshman Kelvin Taylor. A physical back at 6'2", 226 pounds, Jones can run through contact and could be an anchor for Florida’s ball control offense. Taylor, the son of Florida legend and NFL running back Fred Taylor, broke Emmitt Smith’s state career rushing record as a junior. One of the most optimistic developments during the offseason for the Gators’ offense could be the improvement of the line. With Maryland transfer Max Garcia at guard and tackle D.J. Humphries adding weight, the left side of the line could be especially improved. At 280, Humphries is the only projected starter weighing less than 300 pounds. Muschamp would prefer to have all his best players on the field at the same time, which presents an interesting dilemma with both Dante Fowler Jr. and Ronald Powell best suited for the “Buck” position, an end/linebacker hybrid. One could end up playing outside linebacker. Dominique Easley, who led the Gators with four sacks last season, can play both defensive end and tackle. If the Gators are thin anywhere up front, it’s at tackle where Sharrif Floyd and Omar Hunter departed. Linebacker will be the most untested part of the defense, but there’s room for optimism. Sophomore Antonio Morrison moves from outside linebacker to the middle, but he is suspended for the first two games of 2013. He’ll be the Gators’ best hitter. Freshman linebacker Daniel McMillian was one of the breakout players of the spring. He has a nose for the ball and could become a starter as a rookie. Depth is strong at cornerback, enabling Jaylen Watkins and Cody Riggs to play safety. They have a combined 33 career starts, mainly at cornerback. Marcus Roberson is a solid cover corner while Purifoy, who had three forced fumbles and two blocked kicks last season, is the top playmaker. Brian Poole, a special teams contributor as a true freshman, and incoming freshman Vernon Hargreaves III will be tough to ignore even in a crowded backfield. Jeff Driskel, QB – The junior became the first quarterback in FBS history to throw four TD passes while passing for fewer than 100 yards when he did so against South Carolina last season. Loucheiz Purifoy, CB – He’s a returning starter at cornerback, where his nose for the ball prompted Florida coaches to test him at receiver during the spring. Dominique Easley, DL – His ability to play end or tackle will be an asset for Gators’ line. He led the team with four sacks in 2012. Antonio Morrison, LB – Big hitter came off the bench to help seal a Florida win over Florida State in Tallahassee last year. Jaylen Watkins, S – Senior who started 19 games the last two seasons can play corner, safety and nickel. A ball control offense needs a good punter, and the Gators have that in Kyle Christy. The junior averaged 45.8 yards per kick for a team that finished ninth nationally in net punting. The major question will be at kicker where the Gators will need to find a replacement for Caleb Sturgis, who made 24-of-28 field goals last year. Brad Phillips is the frontrunner for the job. Florida’s final record looked like a typical season in Gainesville at 11–2 and a Sugar Bowl appearance, but the Gators were a high-wire act for most of the year. What’s most encouraging is that Florida improved in key areas such as physical play and turnover margin (from minus-12 to plus-15). Expect another tough running game and salty defense, but without an above-average passing attack, the Gators are built for another season of grind-it-out games. 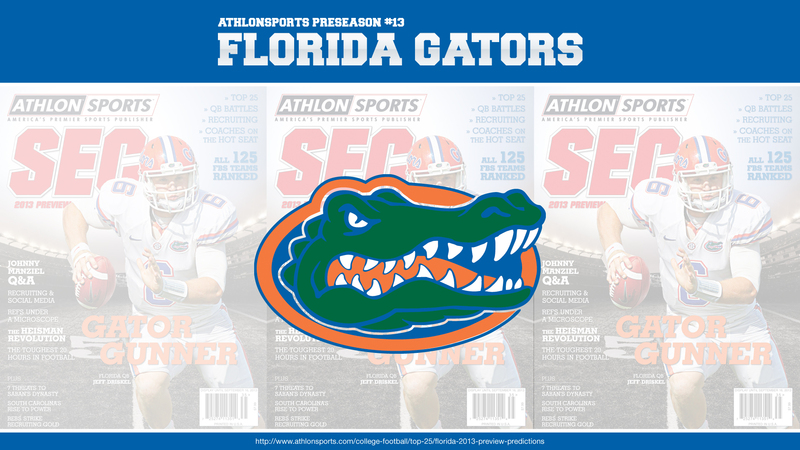 Want to win a poster-sized Athlon cover of your choice? Enter now. Is Jeff Driskel one of the SEC's top-five quarterbacks?